Being involved in an accident is one of the most frightening and upsetting things that can happen to most drivers. Even the safest motorist will likely find themselves the victim of a crash at some point. According to the National Highway Traffic Safety Administration, in 2015 there were 6.3 million police-reported accidents across the country. While most accidents are relatively minor–such as fender benders–they are all unwanted events for those involved. That being said, knowing how to file a vehicle accident report properly can save you a lot of frustration. One of the most important steps you can take when involved in an accident is to file an accident report. However, you may not understand how a vehicle accident report gets filed or who you even file it with. For both legal and insurance reasons, it is extremely important that you understand the process involved in reporting an accident. Otherwise, you could compromise your ability to claim compensation or press charges against another motorist who may have caused your accident due to illegal behavior. It should go without saying, but the first thing you need to do is ensure you, your passengers, and anybody else involved in the accident is safe. If anybody needs medical assistance, call 911 immediately. Never flee the scene of an accident. The legal consequences can be dire if you do so and it could turn an inconvenience into a potential crime. Filing a vehicle accident report as soon as possible can save you a lot of time and resources. After you’ve ensured that everybody is safe and unharmed, assess the damage and make sure you are not in harm’s way. In many cities, if an accident occurs on the freeway then you may be required to safely move your vehicle out of traffic and onto the shoulder if it is possible to do so. In other cases, you may just need to put on your emergency brakes. The laws concerning whether or not you are required to file a police report vary from state to state. In every state, if the accident results in injury or death then you are required to file a police report. The law usually requires you to file a police report if property damage exceeds a certain threshold. This threshold varies from state to state, but generally if the damage is limited to a scrape or scratch then you aren’t required to file a report. However, even if the law doesn’t require you to file a police report, it is often a good idea to do so. For one, if there is a police report on record then you will have a much easier time making an insurance claim later on. Furthermore, a police report is an official record of what happened and it can protect you if the other driver tries to hold you responsible for the accident through litigation. For example, the other driver may have been distracted or even driving impaired at the time of the accident, but without a police report detailing such distraction that driver could easily turn around and accuse you of being at fault. There are two ways to file a police report. If you call the police and they come to the scene of the accident, then they will almost always file a report themselves. If they do, ask to read the report before you sign it so that you agree with everything that is written down. You can request a copy of the report later on. Sometimes the police won’t show up to the scene of an accident. This often happens if the accident is minor and didn’t lead to injury or loss of life or if the police are dealing with a more serious issue at the time. If this happens, you are still free to visit your local police station in person afterwards and to file a report there. If you have to file a report at the station, try to get the names and contact information of any witnesses at the scene of the crash as well as the other driver’s contact info. These witnesses can help provide a more accurate police report. In some, but not all, states you are also required to file an accident report with your department of motor vehicles (DMV). Typically, you must file the report if certain conditions are met. For example, in Oregon you are required to file an accident report with the DMV within 72 hours if property damage exceeds $2,500, the accident resulted in death or injury, or any vehicle was towed from the scene. In New York, meanwhile, you must file a DMV report within 10 days if property damage exceeds $1000 or the accident results in injury or death. Remember that a police report is not the same as a DMV report and even if you file a police report you may still be required to file a separate DMV accident report. Even if you don’t plan on filing a claim, you should report your accident to your insurer as soon as possible. Simply reporting the accident doesn’t obligate you to actually make a claim, but it does make it easier to do so later on. Some injuries can take days or even weeks to become apparent, including potentially severe internal brain trauma. Even if an accident doesn’t seem serious at first, it is always a good idea to report it to your insurer (and to the police) in case your condition deteriorates and you end up needing to file a claim. 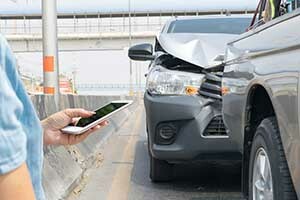 To help boost your claim, try to take pictures of the accident scene and record any eyewitness statements. Filing a Vehicle Accident Report with the various agencies can help you to quickly recover financially from a vehicle accident. Hopefully if you’re involved in a vehicle accident you are not injured, if you become injured then immediately seek medical attention. Follow up by filing a vehicle accident report with the relevant agencies listed above, and seek legal counsel if necessary.